A Knight's Tale is quite a tale alright. It doesn't even really attempt at being an authentic or realistic depiction of the knights and their jousting tournaments of yesteryear. Rather, it is a lighthearted and loosely tied fantasy following the aged old theme (and American Dream) of challenging the social order. William Thatcher (Heath Ledger - The Patriot) is a serf. A nobody. A man who has no future, because he has no past. No heritage. No nobility. However, he does have hope, ambition, and drive. Of course, given the medeival setting, these things (hope, ambition, and drive) are useless. That is, until a bit of luck begins to come his way. When William's knight dies just before a jousting match, he and his friends are at first quite distraught. But William decides to take advantage of the situation and impersonate him in the joust. William straps on the armor for the thrill of a lifetime and commits a very serious crime while doing so. He is not too successful at this first match, but he has whet his appetite and cannot turn away from the path that he has just started. He convinces his friends (above) to follow him on his impossible quest for glory and riches. 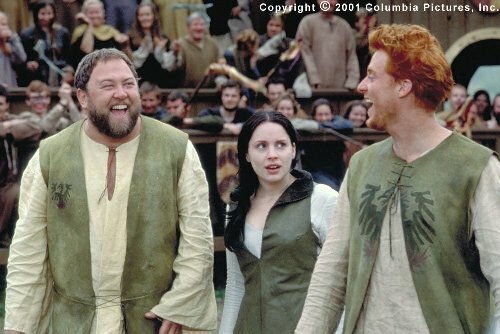 They are soft-hearted Roland (Mark Addy), and the hot-tempered Irishman, Wat (Alan Tudyk). Along the way, they stumble across an unemployed writer Geoffrey Chaucer (Paul Bettany) whos addiction to gambling has left him with nothing at all (and I do mean NOTHING). In return for some clothing and a job as William's scribe Chaucer agrees to forge "authentic" patents of nobility which are needed for William to compete under his new alias, Sir Ulrich von Lichtenstein. 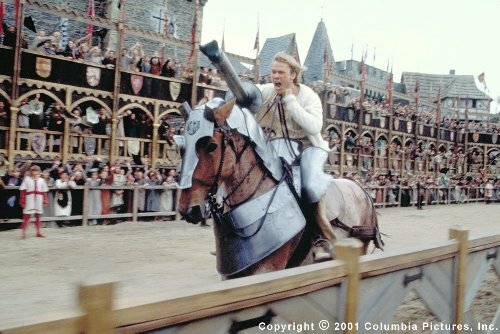 Chaucer, the film's only real tie to history (he is the author of the Canterbury Tales), also serves as William's announcer. In this, Paul Bettany absolutely steals the show. 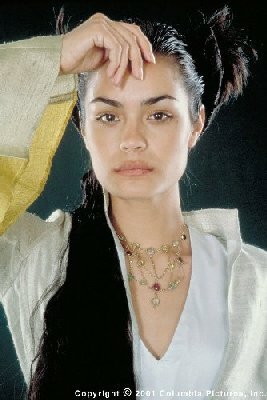 Along the way, William falls in love with a young lady of nobility (whom of course is off limits to someone of his social status), Lady Jocelyn (Shannyn Sossamon - below). And, of course, there is an adversary, Count Adhemar (Rufus Sewell), who is not only his opponent in the tournaments, but also for the affections of Jocelyn. Yes, we've all seen this sort of story a thousand times. And yes, its just as predictable this time around. A Knight's Tale does offer a few original ideas which are a bit refreshing. First and foremost is the classic rock music featured throughout much of the film (the opening scene is to the tune of Queen's "We Will Rock You"). Building on this, they also make the jousting tournaments something akin to a cross between the Super Bowl and Professional Wrestling. A piece of the story which was quite well done and very touching was the story of William and his father, a poor thatcher. The heartache of turning his young son over to work for a knight because it may just give his son a better life than he could provide is sure to make any father teary-eyed. And they joy of seeing the son return home as a hero and champion is sure to make any father teary-eyed all over again. And then there is the female blacksmith, Kate (Laura Fraser - seen in the second picture on the page). Personally, I preferred this down-to-earth (yet still a babe) girl as opposed to the spoiled and stuck-up Lady Jocelyn. Kate was something of a flower in a field of dung, and I was quite dissapointed, but not surprised, that William did not turn his affections toward her. It would have been quite a fitting turn of events for him to discover and appreciate this girl for who she was, ignoring her social status. Instead, William was much too focused on the next big challenge (one of which was winning the heart of Lady Jocelyn, who was "unattainable"). His ambition to overcome all obstacles outweighed any of his other qualities. He pushed himself to the limits not to acheive success, or love, or happiness, or even money. Rather, he did it simply to overcome. He was about winning, defeating, and proving himself. In fact, it got to be a little much for me. I couldn't identify with him. I could easily see him becoming the villian in this story as his ambition and ruthlessness overtook him. However, the movie stopped short of such a character development, and in the end, it was all a sweet fairy-tale type ending for what is accurately and efficiently self-described as A Knight's Tale. It's fun, but it's also so far removed from reality that it's hard to get into. How would you rate the movie A Knight's Tale? There have been 30566 people to visit this page since Sat, May 19, 2001. And you are the first person to visit this page today!